NHS in Leeds, alongside Leeds City Council are reminding you: Got a cough? Get a check. 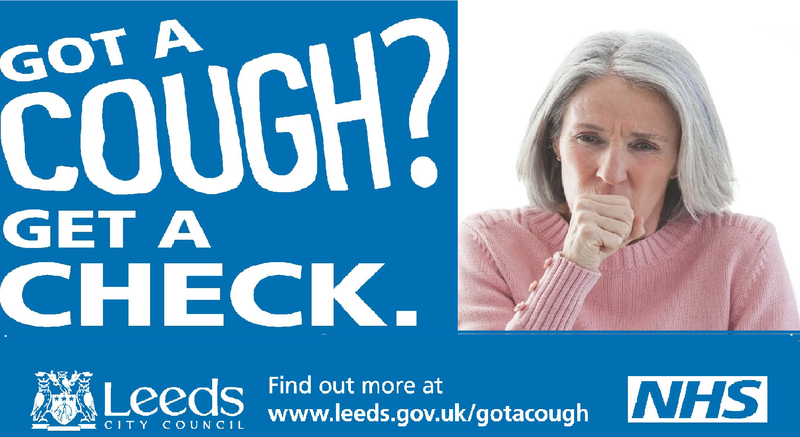 Many people don’t realise that a cough that lasts for three weeks or more can often be the sign of lung problems, so the NHS in Leeds, alongside Leeds City Council are reminding you: Got a cough? Get a check. Find out more at www.leeds.gov.uk/gotacough. The main reason we carried out the campaign was to raise awareness of respiratory symptoms. These include a cough that lasts for three weeks or more, shortness of breath and persistent chest pain. If respiratory illnesses – which are problems affecting the lungs – are caught early they can be treated more successfully. This is particularly important when we are talking about lung cancer, which if left untreated is often fatal. How does lung cancer affect people in Leeds? Few people realise that lung cancer is one of the UK’s biggest killers but also has one of the lowest survival rates. In Leeds, around 500 people a year are diagnosed with the disease, which can be treated successfully if caught early. Unfortunately around 75 percent of those found to have the disease in our city are diagnosed in the latter stages of the illness meaning it is generally incurable and sadly many die within a year of diagnosis.